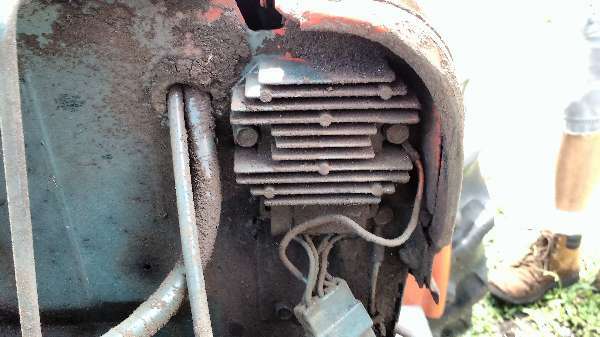 After changing the transmission fluid and the filter the transmission hesitates briefly when engaging the forward pedal before it catches and the tractor moves. Reverse is OK. It acts like there is air in the system but if there is a bleeder screw or valve somewhere I can't find it. The air vent is open (removed it and blew compressed air through it). Fluid levels appear to be ok. As info, I used 4.5 gallons of Hy-Gard and a JD filter; filled the filter halfway with fluid. Is HyGard what they recommend? And why only fill the filter halfway and not all the way? HyGard is what they recommend and what the JD dealer sold me when I told them I wanted to change the transmission oil on a JD755. The user's manual says fill the filter half-way. If you fill the filter full, because it mounts horizontally, a lot would spill before you can get the threads started. A couple things I can think of. First is ther a metal suction screen that is to be checked and cleaned when you replace the fluid? Perhaps you stirred up some contamiants that have it partly blocked. You say it only happens in forward, perhaps less fluid is required when the reverse pedal is pushed. Does the tractor move normally after the first hesitation? If so then your pump is getting enough fluid to function after the initial hesitation. If we've established that the pump is'nt starved then perhaps put the transmission lever in neutral and hold the hydro pedal all the way down for a bit to perhaps max out the fluid flow to clear an air lock. One caution, if there is doubt the pump is lacking fluid then don't do this, a dry pump is a junk pump in a minute or two. There is a metal suction screen which, I'm embarrassed to say, I forgot about cleaning it until I had everything buttoned up. The old fluid was pretty clean and did not seem to have any solid contaminates in it, so I rationalized that I could "get away with it this time". The tractor does move normally after the hesitation, so I'm pretty sure the pump is operating normally. I have operated the tractor in fast and slow positions but I did not try the neutral position as you suggest. I'll try that and let you know. Thanks for the suggestion and your help. Success! With the shift lever in neutral, I could feel it (the air bubble??) in the pedal when I first depressed it and things then smoothed out. Thanks for your good advice and good help. Once in a while I get it right, so glad it worked. The metal screen in the sump is a real mess to check, oil all over you type deal. My current 4310 is my third Deere compact. On the first fluid change from the factory fill I've did the metal screen thing on all three. I've never found anytbing other than a few casting chips that didn't get flushed when the casting was cleaned at the factory. I'd check it at the next fill but for now I doubt it is an issue. Great! I'll quit worrying about it. I suspect you get a lot of them right. All the best to you and yours in Iowa from an old guy in Tennessee.